The weather in the week leading up to the birding cruise I had planned did not inspire confidence. I had some hope as the week went on and the forecast for Sunday was for mostly cloudy with a 40 percent chance of showers with light winds. Given the wind and rain of the week, that sounded pretty good. I set out for the boat a little before 3pm and actually saw some sunshine. Winds were calm, and it looked promising that we might be able to get out to St. Lazaria. While getting the boat prepped for the cruise, I saw several swallows flying around the dock. They were probably barn or cliff swallows, but I didn’t get a great look at them. We loaded up 23 passengers at Crescent Harbor and headed out into overcast conditions with light wind. Between Crescent Harbor and the end of the Causeway, there were more Red-necked Phalaropes than we could count. From Bare Rock we headed out toward St. Lazaria. Some folks seemed interested in several humpback whales near Vitskari Rocks, so we stopped to watch them for a few minutes before continuing on. We went by several small groups of puffins and murres, but figured we would wait to see them at St. Lazaria. We also saw a Black-legged Kittiwake flying by. Murre with Fish: Common or Thick-billed? One of my goals was to get a better idea of how to distinguish Thick-billed and Common Murres. We did observe what appeared to be a classic Common Murre. It had no white along the beak, thin-ish bill, streaking on the sides. 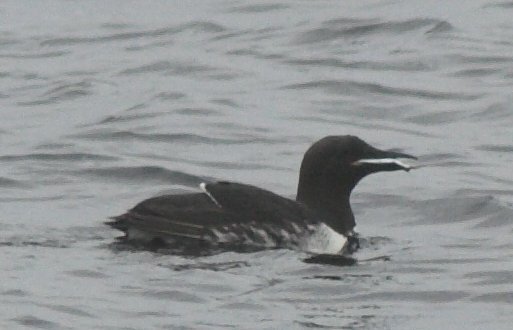 A little later, we saw a bird that appeared to have a big white stripe on the bill and seemed likely to be a Thick-billed Murre. Upon closer inspection, it actually looked like the bird had a fish in its beak, making it a little more difficult to judge. Based on the photo above, my guess is that it’s a Common Murre. On St. Lazaria we saw a couple of people (probably the scientists working there), as well as many murres some Pigeon Guillemots and Tufted Puffins. 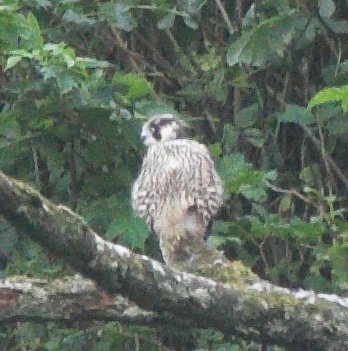 We also saw a Peregrine Falcon perched in a tree. It was some distance away and the lighting was dim, but the mask was distinctive. small caves on the shore. They seemed to have a fairly consitent flight pattern around the boat. They would fly fairly close, but I never did see one close to us in the water. There was a brief discussion about why the Horned Puffins are so rarely seen at St. Lazaria. I also wondered why the birds that preferred St. Lazaria did not also nest out on the south end of Kruzof. The shoreline looked fairly similar to me. 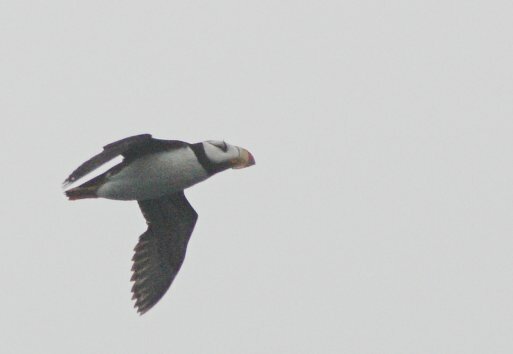 While we were watching the Horned Puffins, I happened to notice two birds flying away. I snapped a photo of them and when I got home, I had a little trouble figuring out what they were. Initially I thought a Goldeneye, but they seemed to not have enough white, so my next best guess is White-winged Scoter, but I am not sure. After spending some time watching the Horned Puffins, we turned back and took a look at the eastern side of St. Lazaria. We passed a Peregrine Falcon flying west. When we got back to St. Lazaria we picked up a couple of Black Oystercatchers on the rocks. From there we headed back toward Inner Point since a couple of people mentioned that sometimes the birds are plentiful near there this time of year. 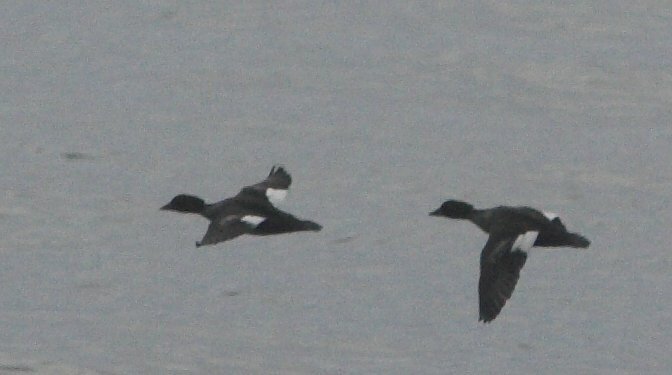 As we approached Inner Point, we saw several Scoters. There was some debate for awhile as to whether they were Black Scoters or Surf Scoters, but I think the consensus ended up being that they were Surf Scoters, though there may have been both. I never really got a great look at them. In the same area there were also several Marbled Murrelets. The last mystery of the day was a flock of a dozen or so birds that looked roughly the size and shape of geese. They flew off when we approached, though they were still far enough away as to be difficult to identify. 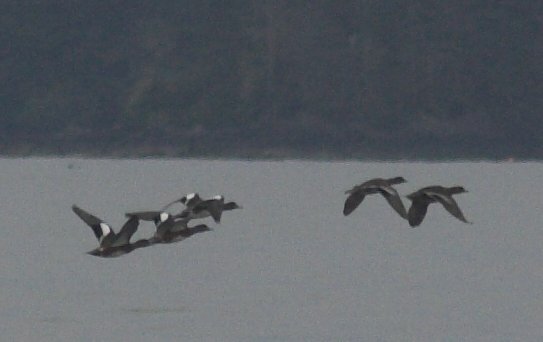 I did get a couple of pictures of them in flight and they look an awful lot like American Wigeons to me from the photos even though they looked larger than that at the time. I guess it can be difficult to judge distance (and therefor size) on the water, so that may have played a role in the confusion. As a follow up, I think that Scott and I saw the same flock of birds flying over Crescent Bay after we dropped everyone off at the harbor and were headed toward Jamestown Bay. They flew over us and in toward Indian River, though I did not seem them fly down for a landing. I saw: Horned Puffin, Tufted Puffin, Common Murre, Marbled Murrelet, Surf Scoter, Pigeon Guillemot, Peregrine Falcon, Black-legged Kittiwake, Double-crested Cormorant, Pelagic Cormorant, Black Oystercatcher, Red-necked Phalarope, Glaucous-winged Gulls. This entry was posted in birds, marine, photo. Bookmark the permalink.